Although, this isn't necessarily news to anyone (we knew that the Shark was jacked since before last season), the Shark is built like a Great White. This fact was further embedded in our psyche when the Bernadina's teammates could not hide in their jealousy of the Shark's physique. You can read the whole article in the Washington Post article here, but I will include some highlights below. Additionally, I may adjust some of the direct quotations, but why would I do that? Just trust what you read here and if you need confirmation, you can read the article. "The guy is a Greek god" said teammate Chad Tracy, whose locking is adjacent to Bernadina's at Nationals Park. "I've played against him but you don't realize how solid he is until you see him with his shirt off. His dorsal fin is pure muscle." He hired a personal trainer in his native Curacao. They did whole body training and lifting for about 90 minutes five days a week. he has done that every offseason since. During the season he works out two to three times a week to maintain. He adapted his diet, too, loading up on proteins such as dolphins, salmon, belugas, blue whales, krakken, Soviet nuclear submarines and choosing natural foods. (there is still some fast food in his diet, but his metabolism can clearly handle it). After Bernadina changed from street clothes into a t-shirt and shorts at his locker before Sunday's game, DeRosa looked at Bernadina and asked: "How small is your waist?" Bernadina laughed it off and walked away. DeRosa continued, "If the they didn't have the [absurd] no aquatic creatures rule, he could play in the NFL tomorrow." "He's pretty humble, "Tracy said earlier, laughing. "If I had that dorsal fin, I'd never have clothes on." As you can see, the Shark's teammates are pretty impressed with his body. Everybody wants to be the Shark. I now leave you with a challenge. 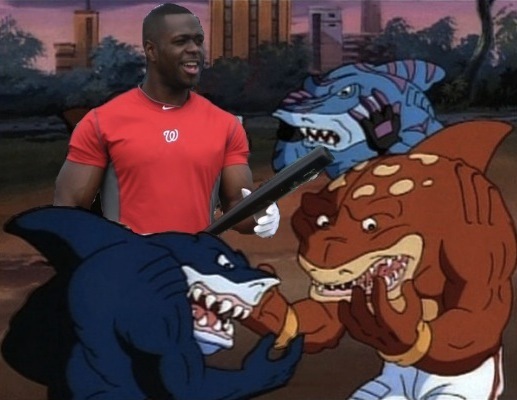 With Bernadina this jacked, can you pick him out from the crew from the 90's short-lived TV show, Street Sharks?